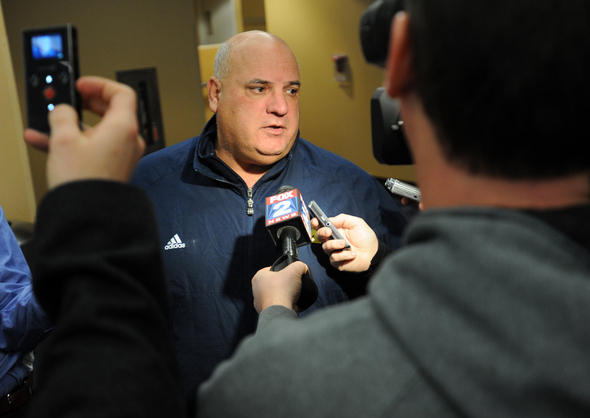 Posted on Wed, Feb 2, 2011 : 6:39 p.m.
Michigan offensive coordinator and quarterbacks coach Al Borges talks Wednesday about the Wolverines' incoming recruiting class. Denard Robinson rushed for 1,702 yards last season - the most ever by a college football quarterback. He probably won’t approach the number again. As the Michigan football team transitions from the spread offense to a pro-style set, new offensive coordinator Al Borges tempered expectations of a possible repeat for his quarterback. Whatever Robinson might sacrifice statistically, his new coordinator said it would be for the good of the offense as a whole. Michigan intends to be a ball-control offense - and score plenty of points. The Wolverines finished third in the Big Ten last year, averaging 32.8 points per game. Robinson was the fixture of the offense. Even though Borges worked on the other side of the country, he was well aware of the sophomore’s breakthrough season. Borges is uncertain of some of the specifics on how he’ll fine-tune the offense for Robinson’s particular talents - but he knows for sure he’ll find a way. At the end of the football season, true freshman quarterback Devin Gardner filed paperwork to petition the NCAA for a medical redshirt year due to lower back problems. On Wednesday, Michigan football coach Brady Hoke said that process is under way. He did not know the timetable for a decision. Attrition seems to be a natural byproduct of a coaching change, but as of Wednesday, Hoke said there have been no changes on the Wolverines roster since he took the job. Not yet, anyway. In some ways, attrition may be inevitable. Pete Bigelow covers the Michigan football team for AnnArbor.com. He can be reached at (734) 623-2551, via e-mail at petebigelow@annarbor.com and followed on Twitter @PeterCBigelow. Fri, Feb 4, 2011 : 4:18 a.m. I shall yell this from the rooftops until my dying breath -- it is NEVER a good sign when your quarterback leads the team in rushing. NEVER. It is a sign of something fundamentally broken with the overall offensive scheme. Thu, Feb 3, 2011 : 5:51 p.m. Some teams win national championships using a spread offense. Some win national championships using a pro-style offense. Some teams win national championships using a power option (think Tom Osborne Nebraska teams). There is no one offense that guarantees success. On the other hand, some teams struggle using a spread, some struggle in a pro-style, and some struggle in a power option. There is simply no correlation between the type of offense you run and your team's success. To claim such a correlation is to vastly oversimplify the issue. There have been many different offensive styles that have enjoyed a great amount of success winning in college football. Some people need to stop pretending that a spread option is the only thing that works, because it isn't. They simply sound stupid when they say things like that, because there are counter examples to their arguments that are far to easy to demonstrate. Okay, but what a non-spread offense hampering Denard Robinson? Well, I seem to recall a couple of Nebraska QBs winning Heisman trophies while running a power option offense. Can anyone at all name a single NFL &quot;mobile&quot; Quarterback that had success running it in the NFL? Steve Young, Donovan McNabb, Randall Cunningham, Fran Tarkenton, and Michael Vick have proven that you can be a very effective mobile threat, even while running an NFL style offense. Just because Michigan changed playbooks doesn't make Denard Robinson any slower. It doesn't take away his ability to move. he is still just as fast as he was in the spread option. Denard Robinson will get to showcase his unique running ability, regardless of the style of offense. Thu, Feb 3, 2011 : 2:39 p.m. I'm sory just a year ago you people were yelling BIG TEN champs if not NC. How did that work out for you? You no nothing that is going to hapen. DR will never be a BIG TEN QB,couldnt hit a deep pass if they were wide open.When it came to running ,he blew against real teams like WISKY,OSU,MSU. It is what it is, thats a team sport. I dont think you fans know how far you realy have fallen. Years pased classes were always ranked inthe top ten and never lived up to it. Now M cant even get a coach it wants, allways at least the third choice. Long live MIKE HART, pride before the fall. Thu, Feb 3, 2011 : 3:37 p.m.
WoW trigg7, what the heck did you have for breakfast? Thu, Feb 3, 2011 : 1:37 p.m.
DRob may not get 1700+ yards rushing, but he will benefit in many other ways from this change: * he'll be more protected from injury in the new offense * he'll be able to continue to develop his passing skills * he'll be leading a more balanced offense * he'll have more weapons to utilize * chances are he will be leading an offense that will improve with fewer penalties &amp; turnovers, and will improve it's Red Zone efficiency ... and thus score more points. * he will be on a TEAM that will have better chances to win games * he will have a better chance to win a Big Ten title and possibly more Also, his chances to win a Heisman could very well improve, even though his rushing stats may drop. You pretty much have to be on a winning team to have a good chance of winning the Heisman, and it is almost impossible to win it on a 7-6 team that gets crushed by Wiscy, OSU,... Also, it is unlikely you will win it if you are injured all of the time. Thu, Feb 3, 2011 : 12:05 p.m.
Thu, Feb 3, 2011 : 3:38 p.m.
Ed, it doesn't mean anything. Thu, Feb 3, 2011 : 9:57 a.m. He should have or still should transfer. I still think that this coaching staff does not want a QB with his skill set. Unfortunately for them they will have to wait and see what Devin has to offer and if he fits their style of play. I think his measureables fit more of what the staff is looking for in a QB. Also, I think it is bad PR if you let the Big 10 Offensive player of the year walk away. I hope it works and the staff can take DRob to the next level. Thu, Feb 3, 2011 : 2:19 p.m.
That's if Devin gets the job? Thu, Feb 3, 2011 : 6:21 a.m.
&quot;Attrition seems to be a natural byproduct of a coaching change, but as of Wednesday, Hoke said there have been no changes on the Wolverines roster since he took the job.&quot; That's so much better than losing Mallet, Manningham, Arrington, and Long. Go Hoke! Go Blue! Beat the team from ohio! Fri, Feb 4, 2011 : 12:06 a.m.
Thu, Feb 3, 2011 : 3:06 a.m.
Much as we like to play the &quot;best ever&quot; game, let's just say that Denard Robinson has 2 more years to prove that he is the best ever at Michigan but nobody gets that title after 1 good year. He had a dynamic and exciting year, but he made plenty of mistakes, too. I would think he should be excited to expand his football knowledge and move beyond the last version of offense that he played in. It will make him a more complete player, a smarter player, a more versatile player, and then maybe, the best ever at Michigan in his position. I think the coaches will certainly utilize his talents and develop it some more, and DR will be the better for it. I personally don't care if it's spread, pro-set, wing, option, run and shoot, or wishbone. If it's executed well without turnovers, then it's good football and it'll lead to improvement of what he have had. It'll be consistent (we hope). Anyone who gets too caught up in a specific type of attack needs to look more at the whole picture and admit that football is a game of precision, execution, and at the end of the day, blocking, footwork, and fundamentals. The teams that do that the best, usually win. Thu, Feb 3, 2011 : 3:05 a.m.
Al Borges could be a little smarter when it comes to Denard Robinson. If he's that good a coach, then he should have pointed out in the press at least, that Robinson was pretty much overused by Rodriguez and got injured as a result. Denard is a great athlete and can become a great quarterback and have a pro career even, if he does not feel that unless he runs 35 times a game he can become that. He could be an ideal option quarterback, use the spread more and more like the pros do, and hone his passing skills in the process. The way RR used him, he would not be drafted in the NFL as a quarterback, which is what he wants to be. So he, Denard, should give some thought to the theory that if you pass and/or run most plays you're out there, you'll get injured too many times and risk too much. Why not become the most versatile quarterback you can be? Fri, Feb 4, 2011 : 12:08 a.m.
Or play another position next year so the pro's can see what else he's got in his speedy bag of tricks. Thu, Feb 3, 2011 : 1:48 p.m.
&quot;If he's that good a coach, then he should have pointed out in the press at least, that Robinson was pretty much overused by Rodriguez and got injured as a result.&quot; That has nothing to do with being a good coach. That's something that we &quot;regular&quot; folk sit here on message boards and article comment sections and say. If a coach says that, there will be articles everywhere about how he took a swipe at Rich Rodriguez and what a &quot;low, classless blow&quot; that is for &quot;Michigan&quot; to take at the &quot;former head coach&quot; and all this unnecessary drama. It's been nothing but class for Michigan since Hoke and staff got here, nothing but positive--let's keep it that way. Fortunately or unfortunately, media presence people have to speak with some political correctness to their comments. Even if a former Michigan player had said something like what you want Borges to say, it would have been made a big deal in the media. Thu, Feb 3, 2011 : 1:54 a.m. Imagine how much running room Denard will have if the Run Option isn't the Most popular play. It was exciting to watch but became obvious to Defenses and the better ones put a lickin' on him. If we run a more pro-style set and give Denard the nod to run-option about 1/4 to 1/5 of the time, the defenses will be backpedaling expecting pass and their eyes will pop out of their heads when they see him running toward them in open field, I can't wait! I wouldn't be surprised to see him get another 1700 yards, but this time with more long runs of over 40 yards and a much healthier Denard. Thu, Feb 3, 2011 : 1:40 p.m.
the Bootleg Option will be his best weapon. One of the only problems DRob had was knowing when to break the play and scramble. If he is put on roll-out passes he'll be able to see the seams up field easier and really showcase his open field abilities in one-on-one scenarios. Thu, Feb 3, 2011 : 2:03 a.m.
Well said j naz.... Would be nice to see alot of big plays by DR. It will be hard to top last years performance in this pro style offense but it will sure be fun to watch an see what happens! Thu, Feb 3, 2011 : 1:50 a.m.
Thu, Feb 3, 2011 : 2:33 p.m. Ya doggy, AZ is half right and so are you put two halfs together and what have you? That's right. You have to have a decent team but when you have that one outstanding player even a decent team can look like well our 97 team with Charles in charge or Tebow at Florida or this years Auburn etc. etc do any of you remember a guy at ohio state by the name of Archie? Mich. had pretty good teams back then but they couldn't beat Archie led ohio state teams well, we could go on and on and on and on. I would hate to see them pull back on DR reins. Thu, Feb 3, 2011 : 2:11 p.m. I love Denard, but he was the only reason UM had hype because the TEAM sucked. I would like to see UM have hype because they are winning games and competing for titles, not because of just one player's greatness in a losing cause. Thu, Feb 3, 2011 : 1:29 a.m. The Team, The Team, The Team - Wins Championships. Fri, Feb 4, 2011 : 12:09 a.m.
Thu, Feb 3, 2011 : 2:17 p.m.
Thu, Feb 3, 2011 : 1:26 a.m.
Thu, Feb 3, 2011 : 1:10 a.m.
Thu, Feb 3, 2011 : 1:09 a.m.
Thu, Feb 3, 2011 : 12:56 a.m. I just hope they continue to recruit guys like robinson to play qb at mich. Otherwise they would never have gotten him. He is the most talented player to ever wear a Michigan helmet. It will be very alarming if this current coaching staff does not recognize this. Thu, Feb 3, 2011 : 2:15 p.m.
Thu, Feb 3, 2011 : 1:12 a.m.
Tom Harmon, Charles Woodson and Desmond Howard were just as talented....and that is not to take anything away from D Rob...he is right up there. Thu, Feb 3, 2011 : 12:55 a.m.
Thu, Feb 3, 2011 : 1:36 a.m.
Murrow, I completely agree with you here. DRob shouldn't be running for 1,700 yards this year. He is not the type of player that can take that many hits (as you've pointed out in your second post). They aren't looking to convert him to a drop back pocket passer. Just looking to develop other areas of the offense and reduce the need to have him running so often. I don't believe that means going away from the spread, just making it look a little more like the Oregon, Auburn, and dare I say Ohio State versions of it. Thu, Feb 3, 2011 : 12:40 a.m.
You Got My Vote. The Spread does not win Crystals or Super Bowls. Thu, Feb 3, 2011 : 1:36 p.m.